Susan Goldberg is editor in chief of National Geographic magazine and editorial director of National Geographic Partners, in charge of all publishing ventures including digital journalism, magazines, books, maps, children and family, and travel and adventure. In addition to a National Geographic expert and a National Geographic photographer, Susan will join the May 25, 2019 departure to share a behind-the-scenes look at National Geographic magazine. Historian Franklin Knight is the Leonard and Helen R. Stulman Professor Emeritus of History and Academy Professor at Johns Hopkins University. His research interests focus on social, political, and cultural aspects of Latin America and the Caribbean, especially after the 18th century, as well as on American slave systems in their comparative dimensions. His analyses of Latin American and Caribbean issues have been aired on National Public Radio, the Voice of America, the British Broadcasting Corporation, the McNeill/Lehrer Report, C-Span, and elsewhere. Franklin has held fellowships from the Social Science Research Council, the National Endowment for the Humanities, the Center for Advanced Study in the Behavioral Sciences, the Ford Foundation, and the National Humanities Center. A past president of both the Historical Society and the Latin American Studies Association, Franklin served as academic consultant to the television series Columbus and the Age of Discovery, The Buried Mirror, Americas, Plagued: Invisible Armies, Crucible of Empire, and The Louisiana Purchase. He was elected Corresponding Member of the Cuban Academy of History in 2012. For more than a decade, Krista Rossow has worked as a photographer, photo editor, and educator for National Geographic. She began her career as a photo editor at National Geographic Traveler magazine, where she shaped compelling stories from world-class imagery. As a freelance photographer she has shot feature stories for Traveler in South Africa, Costa Rica, and cities around the United States like New Orleans and San Francisco. She regularly judges Instagram contests for @NatGeoTravel and photo edits for National Geographic Books. Krista travels with National Geographic Expeditions teaching photography around the world–from the Galápagos Islands, Patagonia, and Morocco to Alaska, Antarctica, and the Arctic. She enjoys traveling and photographing throughout Europe as well, and she sees the camera as a tool for understanding new cultures, meeting the locals, and exploring the natural world. Her images are represented by National Geographic Creative. Tim Weed is an outdoorsman and award-winning author with a long career in international education. A founding director of National Geographic Student Expeditions, he has also directed college semester abroad programs in Spain, Australia, and Venezuela; brought some of the first American students to post-Revolution Cuba in the late 1990s; led travelers through Portugal, Spain, and Patagonia for National Geographic; created and led programs for writers, artists, and musicians in Spain, Cuba, Argentina, Italy, and Ireland; and trekked the Andes in four countries. Tim has authored two books, and his articles on travel, history, outdoor adventure, and the writing craft have appeared in Talking Points Memo, Backcountry, Writer’s Chronicle, National Geographic’s Intelligent Travel blog, and other publications. His is the winner of a Writer’s Digest Popular Fiction Award and a Solas Best Travel Writing Award. Originally from Italy, Gianluca Colla has traveled and photographed around the world, from the Arctic to the Antarctic Circle, from Africa’s deserts to the Amazon and to the Alps. He has covered a diverse range of topics including the secrets of the longest-living centenarians in the world, a lost Da Vinci painting, and hidden mummies in Sicilian crypts. His work has appeared in numerous publications, including National Geographic magazine, Condé Nast Traveler, the New York Times, and the Washington Post. Currently based in Switzerland, he has traveled and photographed extensively around Europe. 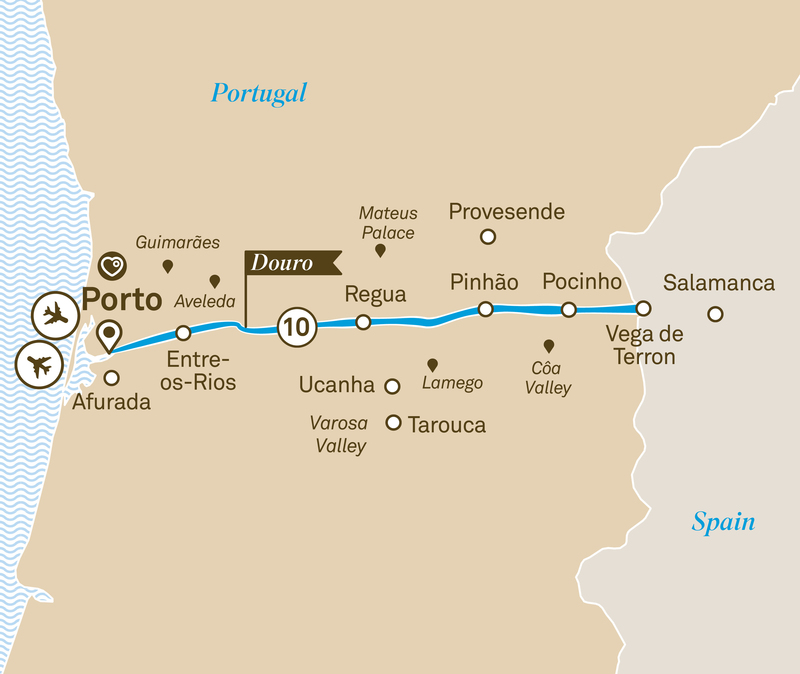 Start your 14 day tour in Porto with a luxury river cruise along the Douro River before flying to Madrid for a three night stay and visit the Prado Museum.